Dr Kayode Fayemi’s inauguration in Ado-Ekiti. Dr Kayode Fayemi, a former Minister of Mines and Steel, has been sworn in as the sixth governor of Ekiti, amid pomp and ceremony. The early Tuesday morning rain, which many regarded as a sign of good omen for the new government, did not stop people from attending the inauguration of Kayode Fayemi as the new governor of Ekiti state. Many were seen trekking long distances to get to the Ekiti Parapo Pavilion to witness the swearing-in of Fayemi and Chief Adebisi Egbeyemi as Deputy Governor of the state. 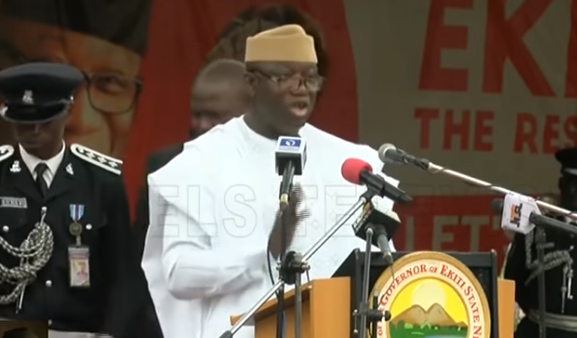 Fayemi, a former Minister of Mines and Steel, was sworn in by the Chief Judge of Ekiti, Ayodeji Daramola as the sixth governor of Ekiti, amid pomp and ceremony. The 14,000-seater pavilion was already filled as early as 8 a.m. by residents and party loyalists from the 16 local government areas of the state. Security in and around the venue was tight as men of the Nigerian Army, police, Customs, Civil Defence and many other security personnel searched persons going into the venue at virtually all gates. Also present at the occasion were: Gov. Atiku Bagudu of Kebbi; Gov. Akinwunmi Ambode of Lagos State; Gov. Nasir El-Rufai of Kaduna State and Gov. Abiola Ajimobi of Oyo State.